In a medium hot skillet, add 1 tsp coconut oil. In a bowl take the corn off the cob and brown in the skillet. Once slightly charred, remove from heat and let cool. In the same skillet, add another tsp coconut oil before adding in finely diced garlic. Cook for 1-2 minutes before adding 1 pack of Beyond Meat Burger patties. Break up mixture and brown meat (for about 6 minutes) before adding in your chili, paprika, and cayenne. 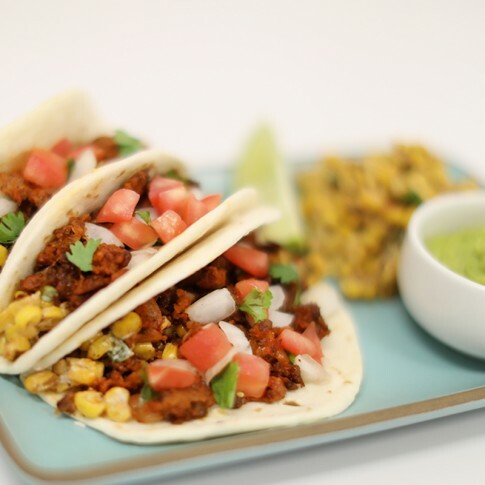 To your chilled corn, add 2 tbs vegan mayonnaise, 1/2 cup diced onion, finely diced jalapeno, lime, salt and pepper to taste. Stir until incorporated. Heat up your tortilla and plate all the ingredients, garnishing with cilantro and a lime wedge.